Integrated Bluetooth enables wireless headset and various other Bluetooth sensors connectivity. Make phone calls to Your employee via Bluetooth headset. No unauthorized calls anymore! Be sure that your employee is always safe and uses hands free headset instead of phone! Don’t lose any records with microSD card up to 32 GB! 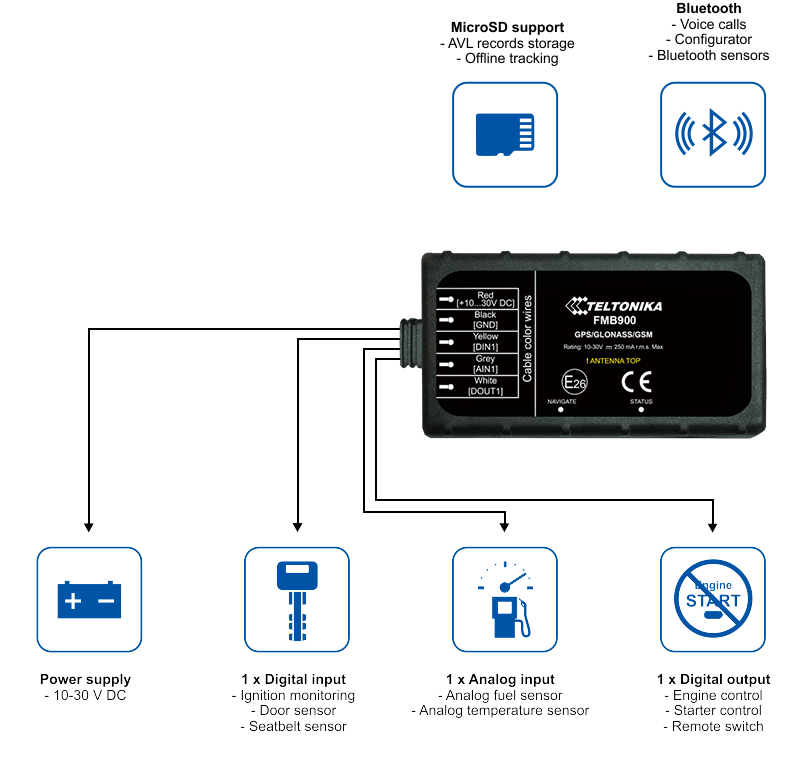 FMB900 will store all data in microSD card when driving in areas where GSM is not available. Prevent your vehicle from theft with advanced antitheft functionality. Combine Auto Geofencing with new Towing detection functionality. Ensure safety of Your employee with smart Crash detection. Get alarm message immediately after accident, save workers life! Easy to install, hard to find! Prevent Your device from unauthorized disconnection using undetachable device cable. Dimensions only 79x43x12 mm. FMB900 features new case design which ensures increased protection against dust ingress and water splash from any direction. It is certified according IP54 protection class. FMB900 with IP54 case can be installed in machines with increased possibility of dust and water ingress.